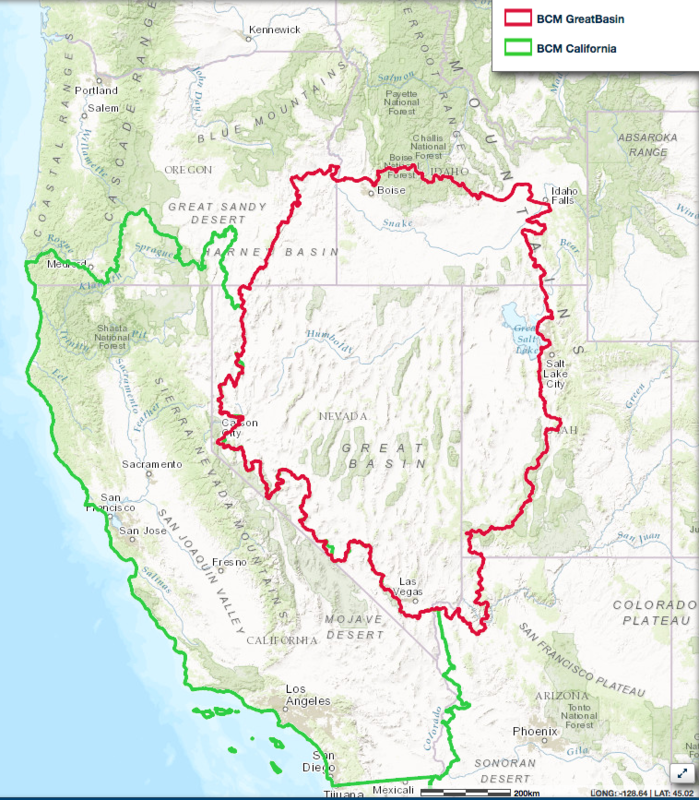 The Great Basin BCM (Basin Characterization Model) dataset provides historical and projected climate and hydrologic surfaces for the region that encompasses the Great Basin, including much of Nevada and portions of surrounding states. The GB-BCM 2014 applies a monthly regional water-balance model to simulate hydrologic responses to climate at the spatial resolution of a 270-m grid. You can download a vector boundary of the dataset here. The revised modeling for the GB-BCM described in Flint et al. 2013, referenced below, includes the updated 800-m spatial resolution climate data from PRISM, the county level soils data (SSURGO) for the entire state, and more rigorous snow and PET calibrations for California. This dataset included updates to all the basin calibrations as well. The future climate projections included the original 4 projections that were revised with bias-corrections to the 800-m historical PRISM climate, plus an additional 3 projections from the CMIP3 dataset (IPCC 4th Assessment Report) and 11 projections from the CMIP5 datasets (IPCC 5th Assessment Report). These projections included a range of emissions scenarios and representative concentration pathways. All projections were processed by the BCM to provide hydrologic response to 18 future climates. Historic: 1921-1950, 1951-1980, 1981-2010 Projected: 2010-2039, 2040-2069, 2070-2099.